When you have picky kids like I do it becomes necessary to come up with creative and sometimes off the wall ways to get nutrients into their reluctant, gaggy little mouths. This month I got around to trying something new. Raw veggies are one of the hardest things to get in our kids. Especially when they are sick. Which is of course when they need those nutrients most. Enter the magic of the gelatin based gummy. 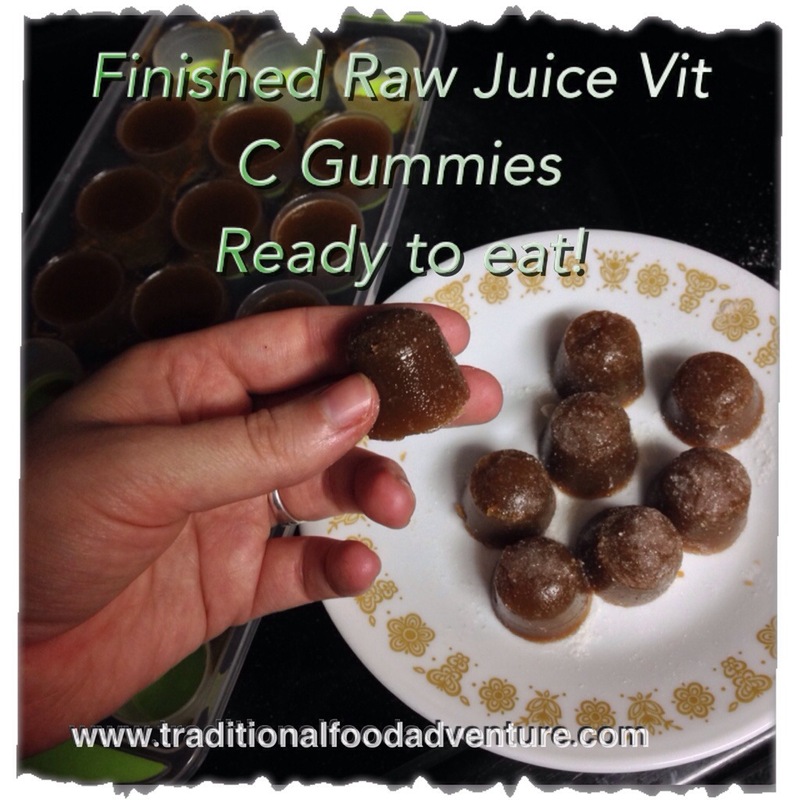 I’ve blogged before about how fantastic gelatin is for the body, here. The marvelous thing about this is that you can customize it to whatever your children need. Can’t get liquid vitamins into them? 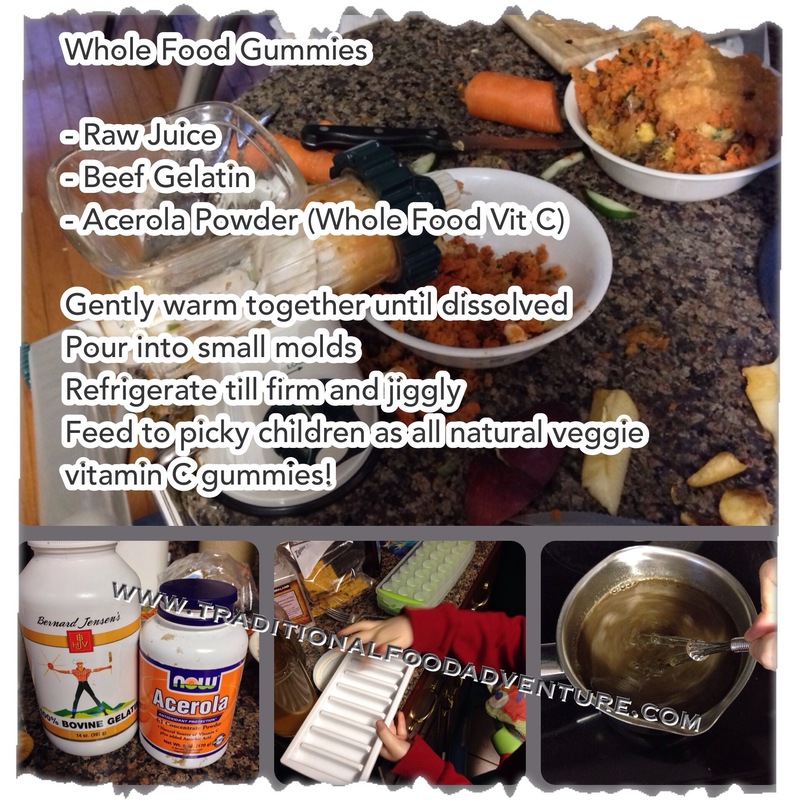 Turn them into Gummies. Not sweet enough? Add Stevia or maple syrup. Our kids have been getting raw veggie juice with whole food based Vit C. They gobble them up like they are delicacies. Haven’t the heart to break the news to them that some of their arch veggie enemies are housed in the nummy Gummies. Some secrets it’s best for a mama to keep to herself. The ratio of liquid to gelatin that I use is roughly 4 cups liquid to 2 and 1/2 tablespoons bovine gelatin. Additional gelatin can be added if you want them extra jiggly. We recently purchased a small hand juicer. It’s fun for the kids to use. Goes just fast enough to make enough juice for gummy purposes. 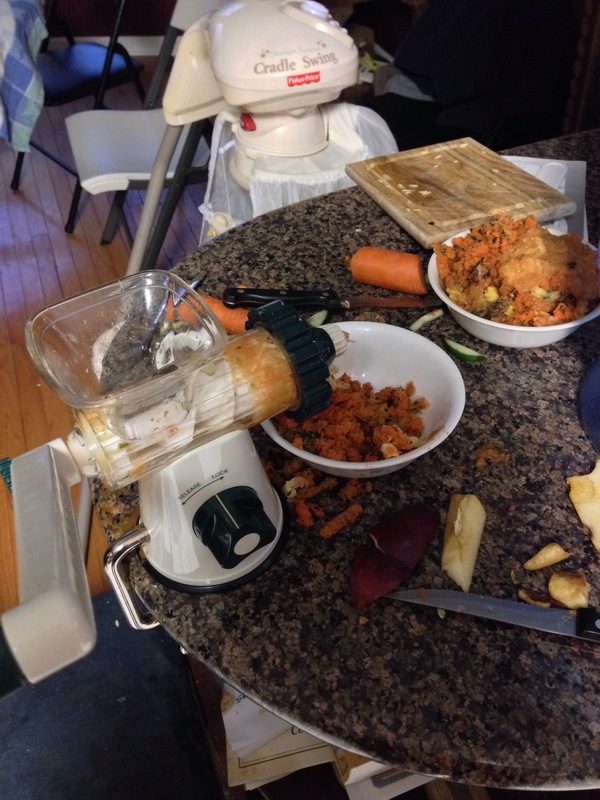 Is easy to clean and oh so much easier than hauling out our huge electric juicer that is best suited for big jobs. Best of all it was cheap enough that even if it only lasts a couple of years it will have more than paid for itself in productive kid distractions and expedient nutrients for kids. 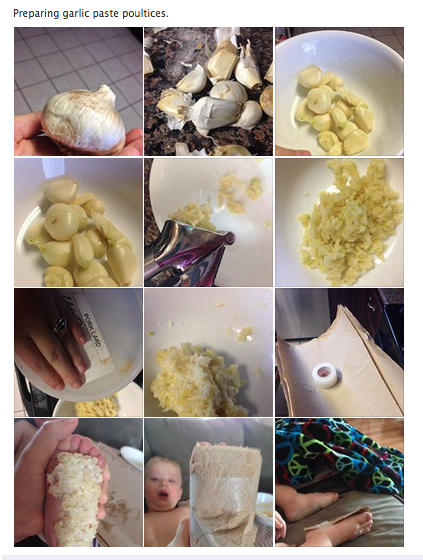 We are big fans of Garlic in our family. We cook with it. Supplement with it. And use it medicinally. Garlic is one of the most incredibly potent antibiotics nature makes and also has components in it that boost the immune system in multiple ways. 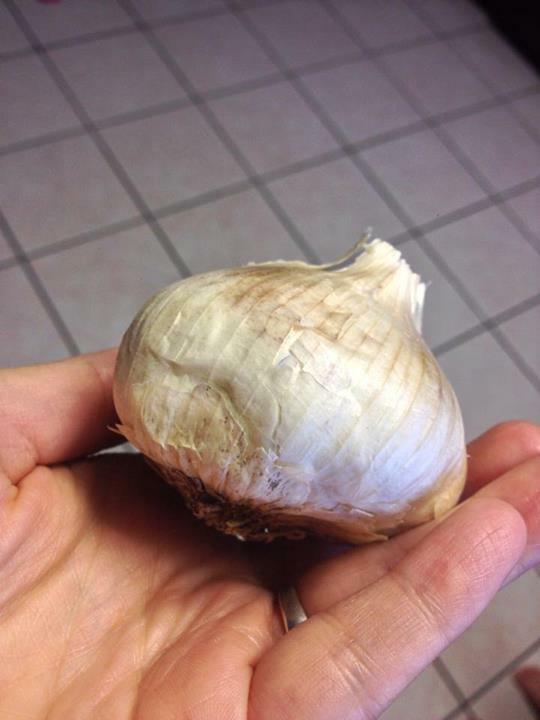 Once a fresh clove of garlic is crushed elements intermingle and create something called allicin. Allicin exhibits incredibly powerful anti bacterial and anti fungal effects. The nutritional industry has figured out ways to stabilize what is, in nature a fragile and limited time availability compound. Once a garlic clove is crushed the clock starts ticking. You only have a guaranteed 15 minutes from the time allicin is activated till the time it begins to fade. Some experts claim it lasts as long as 40 minutes. Immune boosting products that contain stabilized allicin are really fantastic and are an ideal way to get those benefits with no work and no smelly breath involved. The quantities in this tutorial should be enough for 2 to 3 pairs of child sized feet or 1 pair of large adult sized feet. 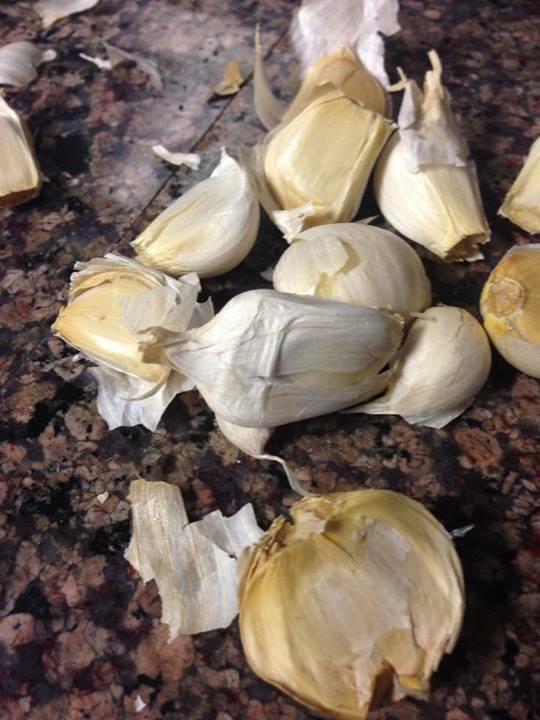 Start with a full head of fresh, raw, organic garlic. Why organic? The point of this is that it is going to be absorbed into the body and blood stream at a rapid rate. Any residual fungicides, pesticides and chemicals that are left on commercially raised garlic will be absorbed along with all the good properties. If it’s a choice between regular ol’ cheapest thing the local store has fresh garlic and none at all, by all means use what you can get. But, ideally, my recommendation will always be organic for this purpose. Pre-minced garlic purchased at the store in glass containers, even that from the refrigerator section will not work for this purpose. Pre-peeled cloves will also not work nearly as well. Stick with the real deal still safely ensconced in it’s feathery papery layers. Loosen all the outer dried layers off of it enough so that you can divide the individual cloves out. Once the cloves are separated lay on a firm surface (I use our granite counter top or a large wooden cutting board) take something solid like the flat bottom of a glass or bottom of a mortar and do a quick “whap” on each of the cloves. The purpose isn’t to crush them but to pop loose the dried individual outer peel enough so that they are easily removed. Once the cloves are peeled they are ready for the next stage! This next stage you have a variety of options. I personally prefer using a tool we purchased a while back for this purpose. A high quality garlic press. Ours has been going strong for years. 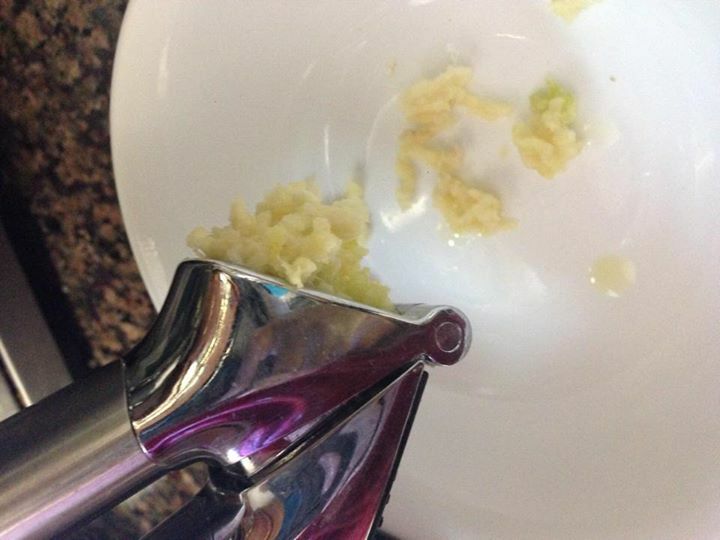 If you don’t own a garlic press you can crush the garlic with a fork and finish off the mincing with a knife. It can also be pummeled into small bits in a mortar and pestle. 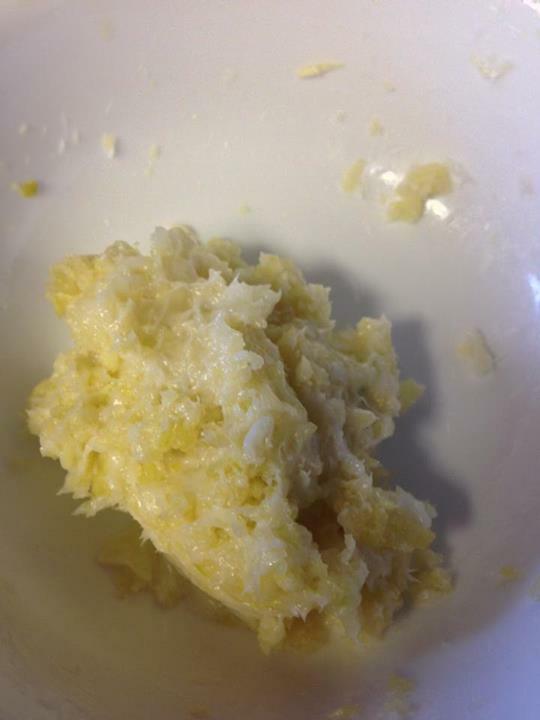 This is what a head of garlic looks like after it’s minced. One of the advantages of mincing is that it goes fast and thoroughly mixes all the different parts of each clove together ensuring optimal allicin creation. This is where the instructions differ from the water and heat based poultices we did before. Although some properties are drawn out faster and more effectively with the hot water it can be somewhat tricky to make sure the water isn’t too hot. Making it into a paste means that the active properties will be drawn out at a slower rate via the warmth of the skin. 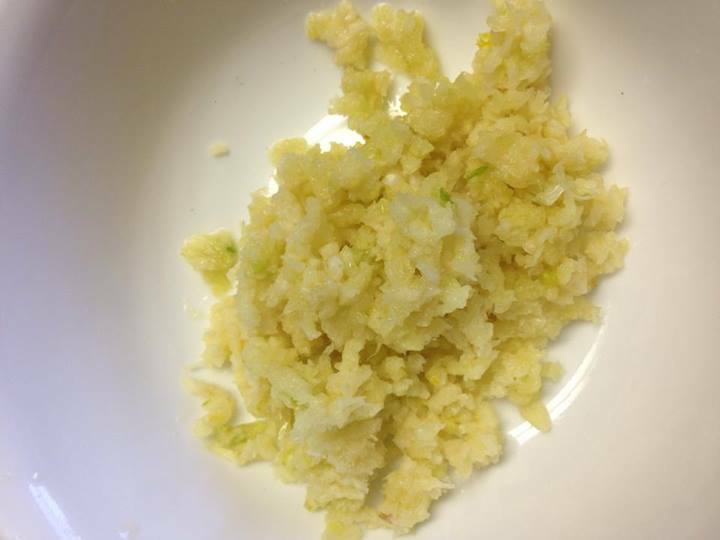 A crucial component of the paste is the base the minced garlic is mixed with. Something too thin will not allow you to maintain that all important “paste like” spreadable consistency. It will also not adequately buffer or protect the skin from the burning elements of the garlic. Part of what makes the paste preferred by us is that it can be worn longer periods of time with reduced chances of irritation and burning over the water poultice method. The original tutorial I read about this recommended using petroleum jelly. Petroleum jelly is a no-no in our house mostly because…well, it’s derived from petroleum. So, it was important to me to find an acceptable substitute. Coconut oil is too thin and melts too rapidly in contact with warmth. Same with olive or almond or any of my normal go-to carrier oils. The first couple of batches I used Beeyoutiful’s Body Butter. It worked incredibly well and was the perfect consistency. It’s also rather an expensive base. With a second sickness hitting our house I needed something that would be affordable to use multiple times per day. As I stood in front of our open refrigerator wracking my brain for what I could use it occurred to me. 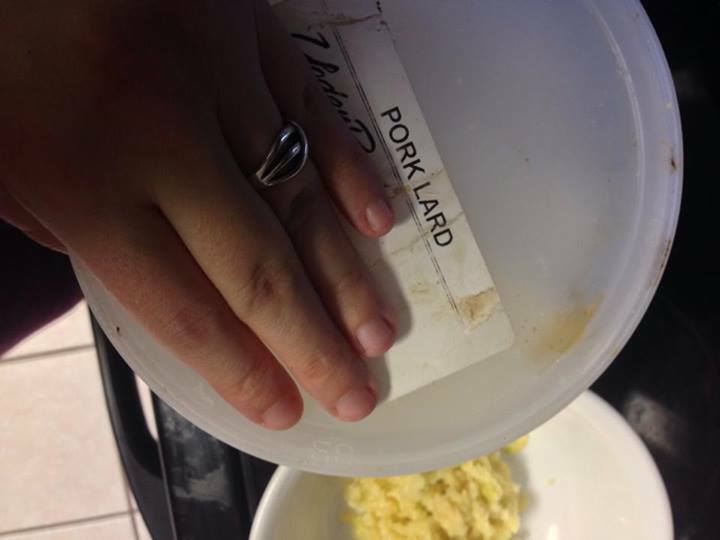 Lard! That lovely tub of white lard. Not the best smelling but relatively cheap, natural and safe. Ideally you want to use at least 50% ratio of base carrier to minced garlic. For very small children, infants or individuals with extra sensitive skin the ratio can be increased to 2 parts Lard (or carrier base of your choice) to 1 part minced garlic. Once the base and garlic are mixed together it should be a thick, spreadable concoction. Although technically this paste could be used on any part of the body my preferred spot is the feet. 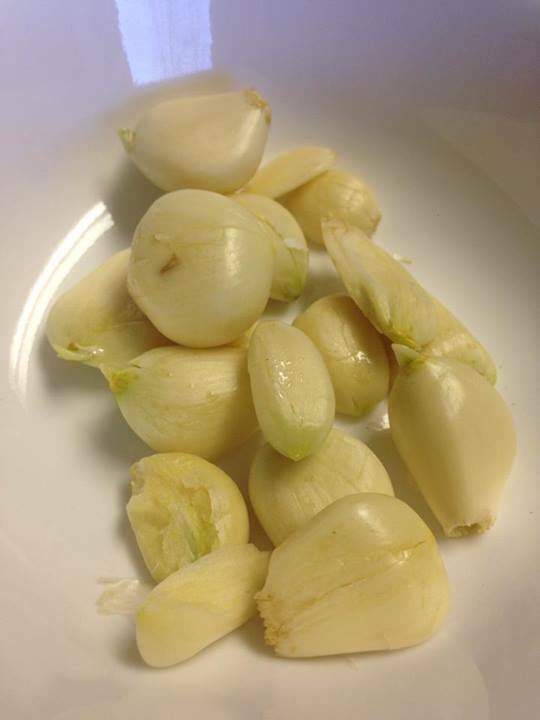 The skin is thicker and more protected from burning there while at the same time having a very high concentration of receptors that handles the uptake of the best properties of the garlic extremely well. Make sure the footsies are clean and dry and then slather the paste on. It’s Ok to be generous! To top the paste off you can use water proof bandages which are my preference because they are nice and tidy with minimal risk of mess leaking out as the oil warms. Ran out of those before writing up this tutorial though so used my fall-back. Folded paper towels. 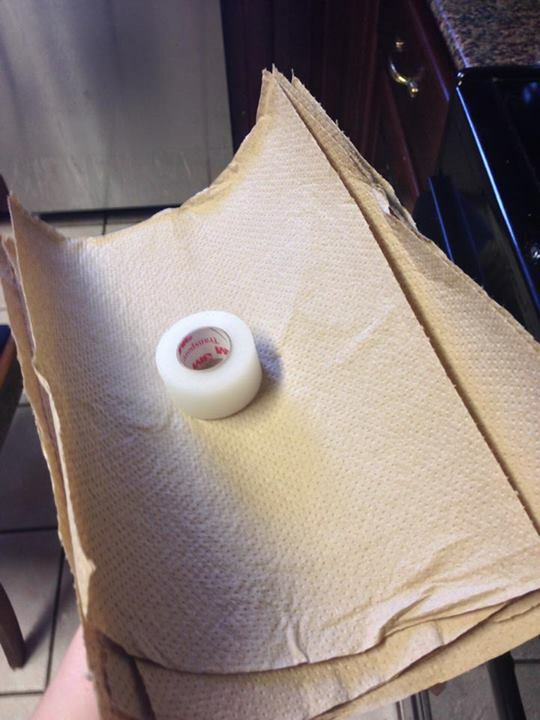 You want the paper towel to be folded in enough layers to keep the oil from leaking out all over everything as the mixture warms against the feet. 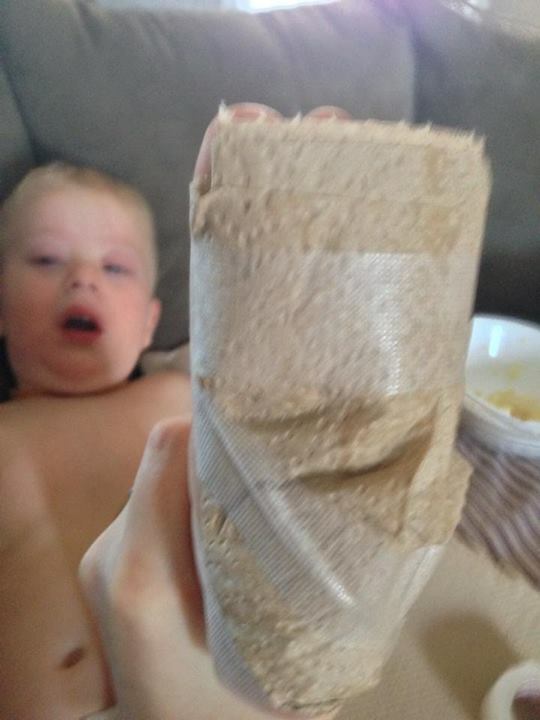 I use medical tape to secure it in place. The finished product on my 2 yo Cmans footsies. For the record, he isn’t crying because of the foot paste, he was on his third hour of crying in misery from the on-set of a virus with full body malaise. He felt much improved after the garlic paste treatment and ran around happily for a couple of hours despite still having a low-grade fever! Please understand that raw garlic potency and “burn factor” can vary a lot from one batch, one harvest, one head and one variety to another. There is no way to know for sure how “hot” a particular batch of paste is going to be. For this reason please DO NOT leave on feet all night as some tutorials recommend. Far too many individuals have been burned this way. Especially do not leave on the feet of children. Check frequently to make sure no initial redness or irritation is starting. My policy is to check every 10 minutes with the paste on our children and more frequently if they start whining or complaining about it. Garlic is powerful. It has literally burned holes into peoples feet. As with all things anything that has properties to be incredibly potent also has the potential to cause harm if not used with common sense, precaution and wisdom. Sometimes it can be hard to tell if it’s “done” or if it’s been left on long enough to do a good job. A rule of thumb that has served us well is to leave it on until you can smell garlic on the breath of the individual receiving the poultice. It’s a sure sign that adequate levels of garlic have been absorbed into the blood stream to do an effective job against whatever you need it to do. As soon as we smell the garlic breath we remove the poultice immediately. And prior to that if any irritation of the feet happens. Let me know if you try this! Happy and safe poulticing and to all a goodnight! With three children now, still working somewhat, attempting to recover good health, attempting to somewhat keep up with a healthy diet while combating serious nursing difficulties over the past few weeks my real life has been in pretty stark contrast to my ideal life. 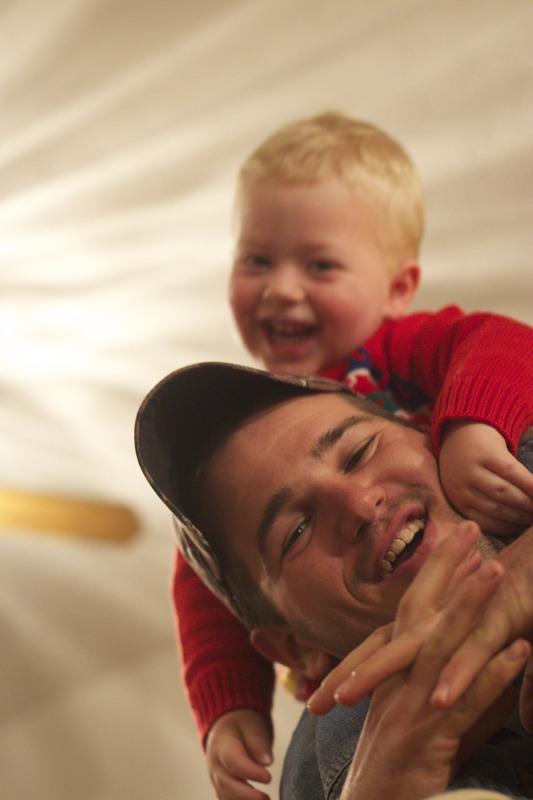 Looking back over the Holidays makes me giggle a little. Cuz laughing at myself is a healthy, sanity saving skill I learned a while back. Our ideal tree, the one that we created hand made ornaments for out of natural and or reusable supplies while having fun with the kids making memories as we made the ornaments was supposed to look something like the one pictured below. In real life, aka as reality our tree looked like a hobo’s collection of ornaments exploded upon it, barely snagging the branches in places and hanging in grouped clusters in others. It’s what happens when kids decorate a tree. Not to mention the bottom half the tree was adorned with everything deemed unbreakable while anything remotely breakable was assigned to the upper half. That is what happens when reality includes a tall toddler man cub loose on the premises. Reality tree also had both white lights and colored lights…mixed…which seemed like it must be breaking some cardinal tree decorating rule somewhere. In my sleep deprived state state at the time I ended up comforting myself by making it a life metaphor for how beautiful messy, mixed up, rule breaking, lives can be. After all some of my favorite photos by favorite photographers are ones in which all the ‘rules’ are broken. Never-mind they are tastefully and strategically broken…not strung together in tangled chaos because 2/3rds of the strings of lights mysteriously refused to work this year. Oh and what about the tree topper you may be wondering? What tree topper? That’s right. Our tree had no topper this year. Was going to get one and then never got my act together to buy one or make one. Our kids thought it was the most beautiful tree ever. And made so many happy memories working on it. My theory is that charlie brown homely trees make kids happier than beautifully and artistically themed for optimal aesthetic pleasure trees do. In an ideal world, we were going to make 7 different kinds of gourmet cookies in large batches, from scratch with all natural ingredients spread out over several days. 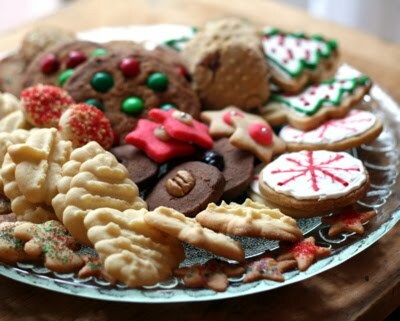 Once they were all completed they would be divided up into beautifully arranged cookie gift platters and given to relatives, neighbors and friends. It was going to look something like what is pictured below. Reality was that one single type of cookie was made in one large batch. 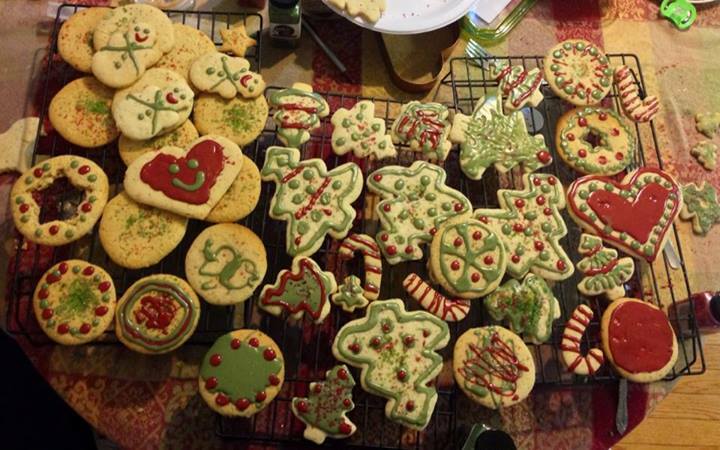 It took all evening with my little helpers fully engaged to bake sheets and sheets of cookies while the little ones took turns helping with the decorating icing bags and naturally dyed sugar sprinkles. That single solitary type of cookie ended up looking like this after they were decorated and left for the icing to firm up on cooling wracks…Picture taken just prior to the previously mentioned bear cub toddler helping himself to them by shoving a chair over to the area to gain access. Returned to the kitchen to find the icing scraped off of half of them and about a third of them crumbled into a pile of crumbs. Yup. That was memory making reality. Our cookie gift baskets were stocked with Trader Joe’s cookies instead. Bless them for both having a wonderful holiday variety along with lots of gluten free options as well and fairly wholesome ingredient listings. It hurt my perfectionistic, bakers heart to the core but it got the job done. Ideally we were going to spend the days leading up to Christmas doing all sorts of fun, Advent themed projects while carefully packing gifts for the many family members we planned to see on our long anticipated trip down to my home state of GA. 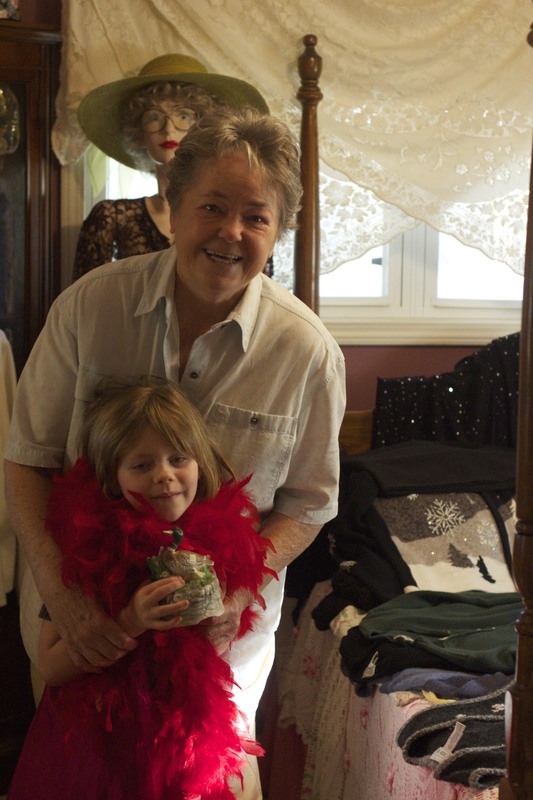 It was going to be organized, neat and tidy, personalized and done on time because I had a plan. Reality was our wee baby boy got sick. Very sick. The trip was cancelled while we waited hour by hour to see if we would have to take him to the ER. He took a drastic turn for the better the day after we were supposed to leave and we decided to go after all. We packed in a mad, slapdash manner. All order out the window. 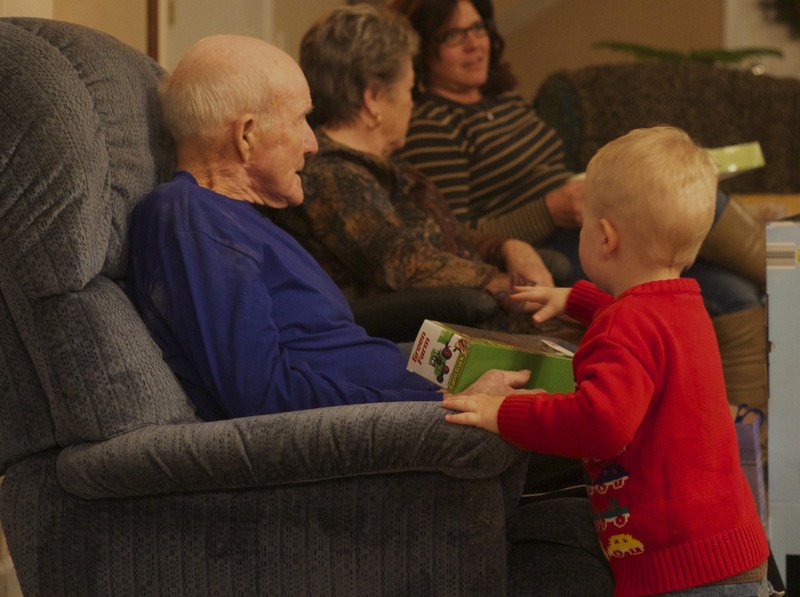 Barely grabbing enough supplies to throw together basic gifts for the family without all the personalized notes and special touches that were planned. Almost all of the ‘ideals’ and plans my over achieving self could come up with went up in flames this year. Reality came along and tore them to bits, trompled all over them and ground them into oblivion for good measure. 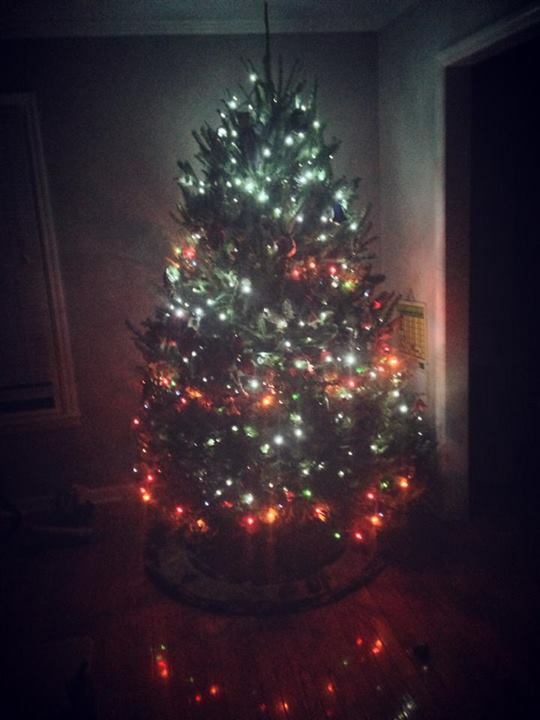 While nothing that came out of my holiday was Pinterest worthy…it was perfect. Beautifully sweet. Peaceful. Surrounded by loving people. My sweet little immediate family and lots of extended family from all sides. Overwhelmed by generosity to us and our kids. Delicious food. 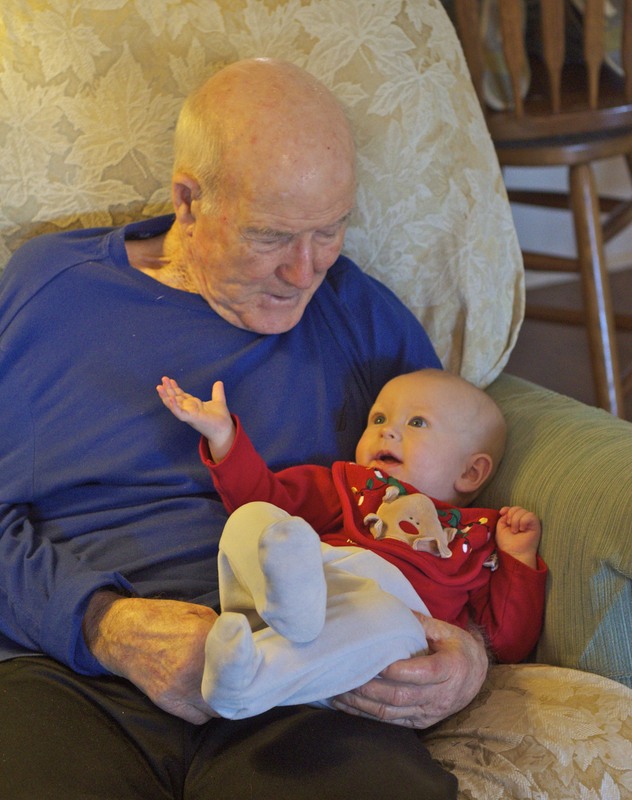 And an older generation that we may not see again earth-side meeting our youngest. Tears of happiness were shed more than once. 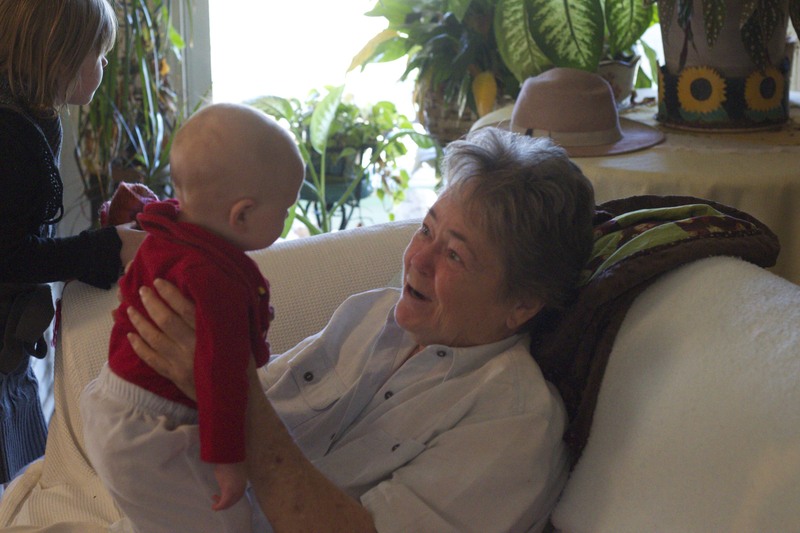 Hope the Holiday Reality you experienced was every bit as wonderful as the one we were blessed to have.